There’s an age-old joke in the Arab world which overtly suggests that Sudan is the slowest country in the region to catch on to hot trends. While such anecdotes may make good joke material, the idea could now be haunting Sudan’s leaders as they face up to a wave of mass protests against their rule, with scenes similar to those seen two years ago when the Arab Spring swept the region. For Tunisia, Egypt, and Libya the Arab Spring has been and gone, but not without leaving behind a legacy. Events in the countries sparked a fiery regional shift, the repercussions of which have already been put into question. It has been a turbulent past two years, giving international observers the opportunity to create a raft of seasonal terms to describe what followed: a Summer of Protest, an Anti-American Autumn and an Islamist Winter. Now, as Sudanese protesters begin their battle with the government, many are wondering whether Sudan has finally caught the regional fever. “The protests reflect the same sentiments as the Arab Spring uprisings,” said Alex de Waal, a British writer and author on Sudanese affairs. “The Sudanese government is divided and is mishandling the situation. The fuel price rises were only the spark for expressions of a deeper discontent,” Waal told Al Arabiya News. Over the past week, thousands of protesters have relentlessly poured out onto Khartoum’s streets, as police continued to fire teargas to break up crowds spiritedly chanting “freedom, freedom” and branding Sudanese leader Omar al-Bashir a “killer” after protests turned deadly. Authorities say that 33 people have died in the protests so far, while activists and international human rights groups put the death toll at 50, according to Agence France-Presse. The body count makes the protests the deadliest since Sudanese President Omar al-Bashir’s regime took power over two decades ago. The protests began when the oil-producing country scrapped its fuel subsidies, but quickly morphed into expressions of anti-government sentiment. On Friday, more than 5,000 people demonstrated in the capital, Khartoum, the biggest protest turnout in central Sudan for many years. On the same day, Sudan’s government ordered the closure of Al Arabiya TV’s Khartoum office, just hours before summoning the channel’s correspondent for questioning. 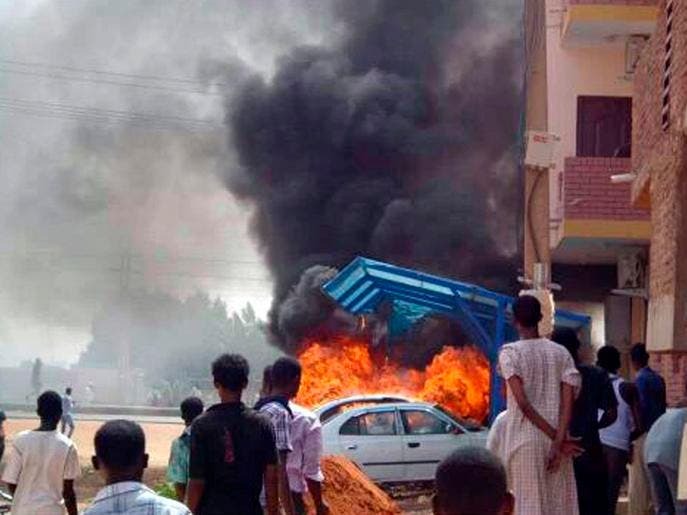 “I do believe this is Sudan’s ‘Arab Spring’ – delayed only until anger finally overcame fear, as it now has clearly done,” Eric Reeves, a researcher and analyst of Sudanese political affairs, told Al Arabiya News. 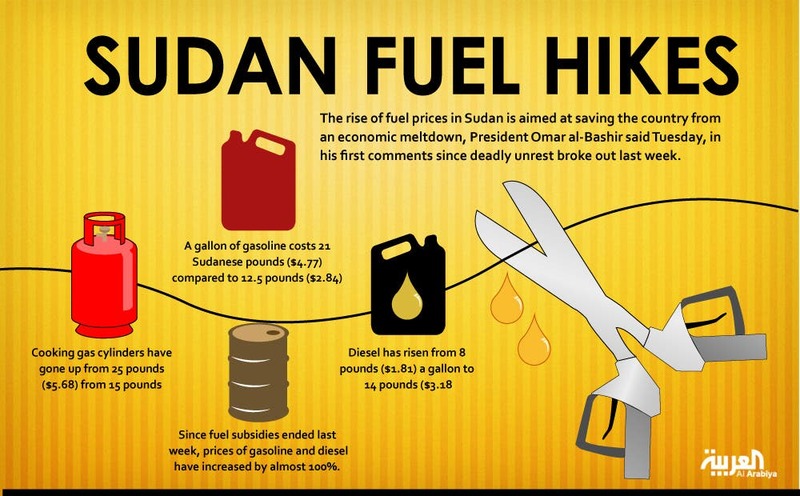 More than two dozen officials from the ruling National Congress Party urged Bashir on Saturday to reinstate fuel subsidies and to stop killing protestors, according to the Sudan Tribune. “The crisis is deeper than a matter of just raising the prices of these various oil and gas-related products,” says Osman Bakhach, a spokesman for Sudan’s Hizb ut-Tahrir opposition movement. “At Hizbut ut-Tahrir, we oppose this government. 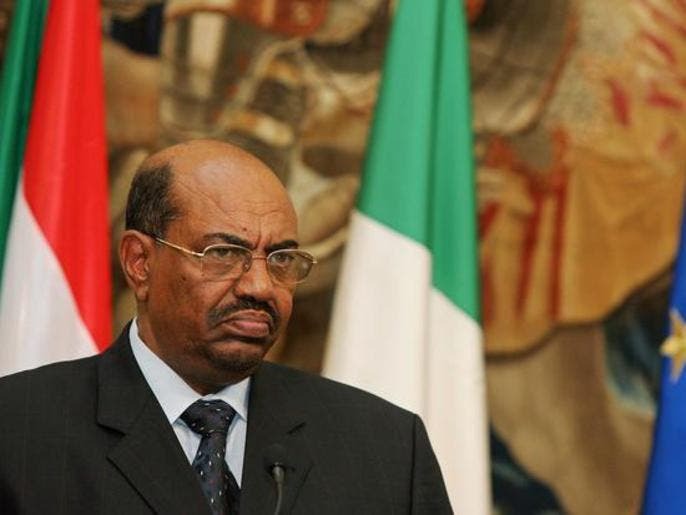 Bashir is responsible for the failed measures and policies his government has implemented,” Bakhach told Al Arabiya News. “We call for this whole regime to be brought down. Potentially, this unrest could grow into another Arab Spring. But at the same time, we notice that the so-called opposition parties have failed to fully support and stand by the popular protest,” he adds. Since fuel subsidies were lifted, prices of gasoline and diesel have increased by almost 100 percent. “This is what prompted many in the regime to call for a restoration of the subsidies. but this only compounds the problem,” said Reeves, citing high inflation which he estimates was over 50 percent before the subsidies were lifted. “Now, money will have to be printed to cover the enormous budget cap and accelerating inflation, which may turn into economy-destroying ‘hyper-inflation,’” added the expert. Meanwhile, the loss of oil revenue has led to a critical lack of foreign currency reserves, he said. “Sudan can no longer finance its imports, since no one wants to be paid in Sudanese Pounds, which have lost a tremendous amount of their value in a very short time,” said Reeves. “Also, the failure to attend to the desperate need of agriculture, over many years, has obliged the regime to import large quantities of food, especially wheat. And over this all looms the $42 billion in external debt, which can neither be serviced nor repaid,” he added. 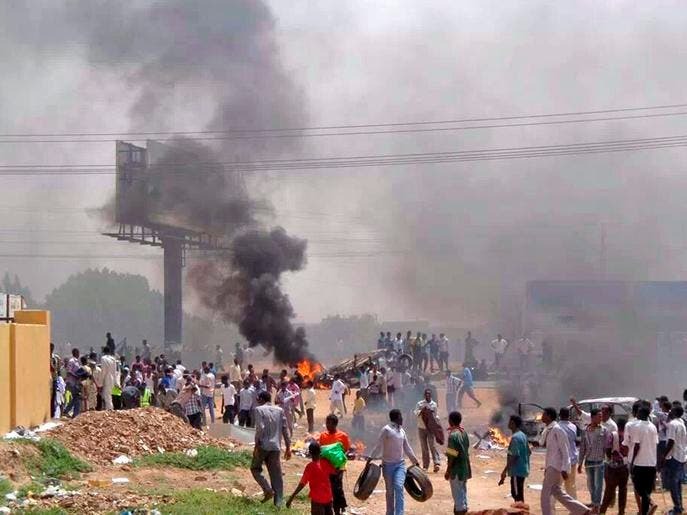 In addition to Sudan’s dismal economic indicators, there is also the issue of reports that government officials fled the country as the unrest began. The news is reminiscent of events in Tunisia and Egypt, where top officials left at the first signs that security forces were no longer able to control the angry masses. “I have received repeated reports of senior regime officials and their families moving out of Sudan. Dubai and Germany are two destinations I’ve noted in the accounts,” says Reeves, amid media speculation that Foreign Minister Ali Karti sent his family to Dubai several days ago. For Bashir’s regime, “there is no place to hide” if the uprising lingers, says Reeves, adding that officials are attempting to use censorship, propaganda, and the unconstrained use of force to face the backlash. 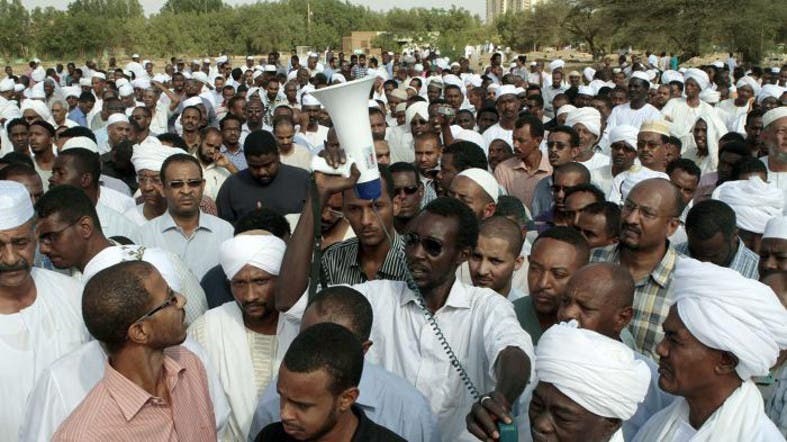 But for some Sudanese observers, the protests aren’t entirely reminiscent of a fully-fledged Arab Spring-style revolt. “It may not be accurate to say that what’s happening in Sudan is an emulation of an Arab Spring uprising,” said Sudanese political analyst Mahmoud Tamim. “In modern history, the Sudanese people have twice risen against military rulers – in 1964 and 1985. They were two regimes that won power through a coup against legitimate and elected authorities,” added Tamim. “The current leadership has been rejected since its early days in power, while the Sudanese opposition has not been effective enough to empower the people to oppose the leadership. 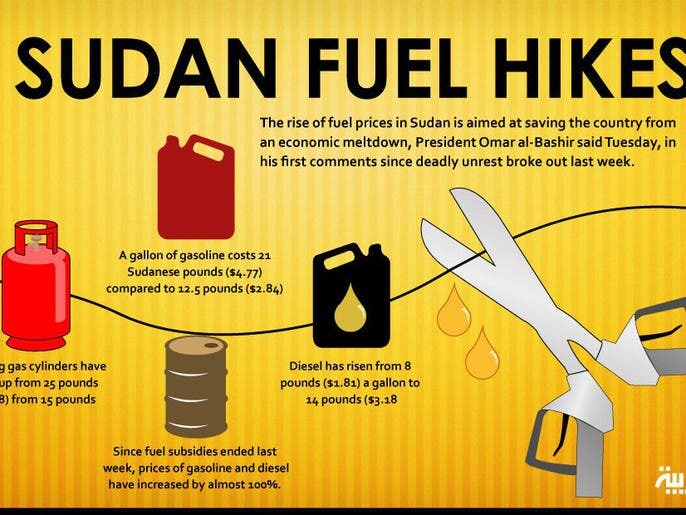 This is what has made Bashir’s government stick around for so long,” said the analyst. Another advantage for Bashir could be that there has not yet been a clear response to the protests from the international community. “Various Western governments as well as the United Nations, the African Union and the Arab League are showing no real sympathy for the cause of those demonstrating; nothing that might cause the regime to reconsider its policies,” says Reeves. Still, those wishing for the protests to evolve in a government-changing uprising have spotted several obvious factors similar to those that sparked the Arab Spring, according to Tamim. “The people are protesting against the deterioration of living conditions, the economic environment, and the leadership’s power grab as well as the repression of the opposition,” he says. While the protester’s demands have now been made clear, what happens next is still up for speculation, with fears that the deadly violence may swell. “We have to wait a week or about 10 days to judge exactly where the Sudan protests are heading,” said Khalid Ewais, a Dubai-based Sudanese journalist. 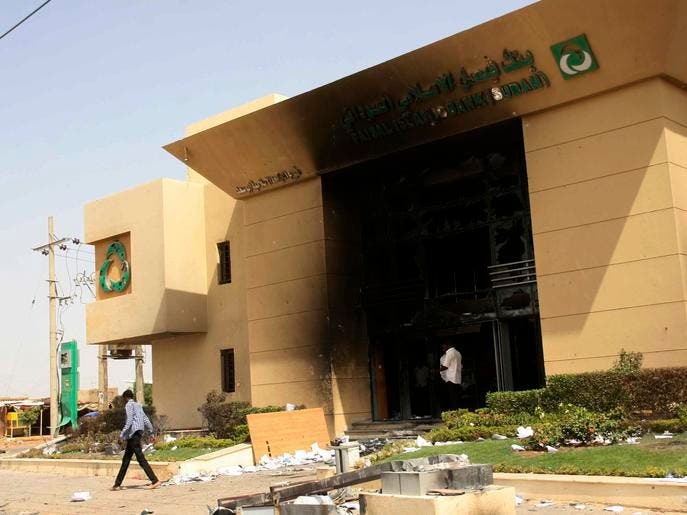 “Will this be a short uprising that the Sudanese government will be able to crush? Or will it be a third Sudanese revolution? We can’t figure that out yet. “Either way, it’s clear that there is popular support to rid of the country of the dictatorship led by Bashir,” Ewais added.